Can Extended Working Lives Enhance the Sustainability of Social Programmes? It is now well-understood that population ageing is occurring throughout the developed world and beyond. With reductions in both mortality and fertility, population structures are changing. Specifically, the ratio of older people to younger people is rising and this is leading to concerns about the sustainability of age-related social programmes, in particular pensions and health. Against this background, there is much debate about the options through which the sustainability of these programmes can be assured. One option is to increase taxes and social contributions. While such an approach might form part of an overall solution, standard questions arise about the political acceptance of increased taxation and possible negative effects on economic activity. Another option that is increasingly discussed is extended working lives. If people remain in the workforce for longer, this would have positive impacts on national output, thereby increasing the tax base and making social programmes more affordable (as a percentage of GDP). In addition, to the extent that prolonged working lives would allow for the delayed payment of pensions, the sustainability of pensions systems could be further enhanced. This second option also gives rise to questions, in particular about the feasibility and desirability of extending working lives. In this paper, I will explore this issue by discussing what economics research has uncovered about the reasons for retirement and the effects of retirement. If we have a better understanding about these issues, we will be in a better position to assess whether extended working lives is, in fact, a practical route to contributing to the sustainability of social programmes. Much of the current debate assumes that retirement is highly valued by people and that suggestions of extending working lives would be widely resisted. However, if retirement is less desirable than is commonly understood, there might be more scope for achieving sustainability through extended working lives than is currently understood. The rest of the paper is structured as follows. In Section 2, I will motivate the discussion further by outlining the thoughts of the German economist Axel Borsch-Supan on what he calls “some popular myths” about older workers and retirement. In Section 3, I will outline some international evidence on retirement and its effects. In Section 4, I will turn to the Irish research, specifically research based on the Irish Longitudinal Study on Ageing (TILDA). In Section 5, I will offer some conclusions. Section 2: Some popular myths? In a paper published in 2013, Borsch-Supan (2013) discussed the economics of ageing populations generally but paid particular attention to the issue of working in later life. In the course of his discussion he identified a number of “myths”, to use his terminology, and I will present them here. 1. Declining health limits the capacity to work at older ages: According to Borsch-Supan, our understanding of when retirement should take place is based partly on the notion that health begins to decline when people are in their sixties and so less able to work. He argues that improvements in health status mean that many people in the sixties and seventies are just as able to work as they were in their forties and fifties. Clearly, this does not apply to all people and especially not to people in physically demanding jobs. However, with the rise of knowledge-based occupations and improved health, it is not clear that health should be a driver of retirement for many people in their sixties. 2. Retirement is bliss: Economists, and others, have increasingly questioned whether people are as happy in retirement as they seemed to expect. There is a growing realisation that work provides benefits in addition to payment including social interaction, purpose and stimulation. While such positives can be found in other areas of life, including through volunteering, they can also be present in work-lives and so the loss of these features of work can be harmful. 3. Older workers are less productive: In addition to the supposed health declines mentioned under myth 1, it is often assumed that the productivity of older workers declines because of skill obsolescence. For example, if older workers have acquired their education and formal training at the start of their careers, it is argued that these skills will be out-of-date at the end of their careers. While this might be true in certain circumstances, there is little evidence to show that this is generally the case. This could be because people continue to invest in their skills over their careers, even at an informal level. It could also be the case that employers adjust their processes to assist older workers in maintaining their levels of productivity. Finally, the possibility also exists that the value of experience counter-balances any losses from health or skill obsolescence. 4. Keeping older workers creates unemployment for the young: This argument is seen as reflecting the “lump of labour fallacy” – the mistaken belief that there is a fixed quantum of work to be done and that the addition of one worker to the workforce must result in the subtraction of another worker. Similar arguments arise with respect to immigration. Research shows that economies are much more dynamic than suggested by this very static view. If managed correctly, economies can create more employment opportunities as extra people enter the labour force. In this section, I want to explore why people retire at certain ages and what the effects are. I do not plan on being extensive but only to highlight some of the issues that are emerging from economics research. 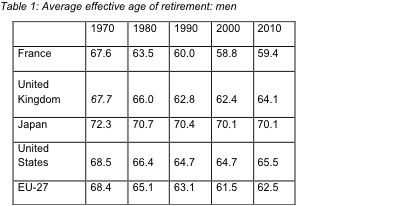 I will begin with Table 1 which shows average effective retirement ages for men across a number of OECD countries. Before discussing the patterns in the table, it is important to stress that the ages presented are not mandatory retirement ages or statutory retirement ages. The data shown reflect the average age of retirement across the countries and over time and so reflect actual outcomes. There are two broad points that can be taken from the table. First, if we focus on the figures for 2010, we can see a wide variation across the countries in the average retirement age. The average is under 60 in France and over 70 in Japan. The second point to be taken from the table is the remarkably common pattern across time. From 1970 through 2000, the age of retirement fell in all countries and this was expected based on standard economic analysis. Economists explained this pattern by saying that leisure (non-work time) is a good thing like any other and that people chose to “purchase” more of it as they get richer. In the case of retirement, leisure time is “purchased” by foregoing salary. There was an expectation that this trend would have continued but this was not the case. Average ages of retirement have increased between 2000 and 2010 in most of the countries listed and have remained constant in Japan. The general lesson to be taken from Table 1 is that no sense emerges across countries and across time that humans are converging on a single age at which retirement occurs. This leads to the question of what determines the age of retirement. A simple answer to this question would be that people retire when their place of work offers them their pensions and/or tells them to retire but this is overly simplistic. Clearly, many people retire before the age of 65 which is the typical age for pensions being made available. Also, people are generally at liberty to take other jobs even if they have retired from their main job. Possibly the most influential work on the question of age of retirement within the economics discipline was led by Gruber and Wise (see, for example, Gruber and Wise 1999 and 2004). They brought together an international team who examined the parameters of the pensions systems across their countries in a way that allowed for cross-country comparisons. Two main lessons on what determines the age of retirement emerged from the work led by Gruber and Wise. First, financial incentives matter. In particular, where there is no reward for prolonged work and prolonged contributions to retirement funds, people are seen to retire when their pension is made available to them. Second, norms matter too in the sense that many people retire at the standard retirement age of 65. Before leaving this brief discussion on the international view on the age of retirement, I will provide an overview of one paper which looks at one effect of retirement, namely, the effect of retirement on mental health. Heller-Sahlgren (2016) uses data from a trans-European survey of older people and asks how mental health changes around retirement comparing the recently retired with people who remain in employment. He finds that there are no mental health effects of retirement in the short-run but after four years the retirees show more evidence of depressive symptoms. Heller-Sahlgren’s conclusion is striking so it is worth quoting it here: “the paper’s findings suggest that reforms inducing people to postpone retirement are not only important for making pension systems solvent, but with time could also pay a mental health dividend among the elderly and reduce public health care costs”. The research papers that I will refer to here are all based on data from the Irish Longitudinal Study on Ageing (TILDA) so I will briefly describe the TILDA study. In 2010, over 8,500 people aged 50 and over who were living in Ireland were interviewed for the study. Information was collected on a wide range of topics covering health, economic and social circumstances. The participants were also invited to undergo a health assessment, through which large amounts of objective health data were generated. The original group of participants were re-interviewed in 2012 and 2014 and are currently being re-interviewed. By following the same group over time, an incredibly rich dataset is being generated which captures the process of ageing in Ireland. The first paper on retirement using the TILDA data was Barrett and Mosca (2013). During the first wave of data collection in 2010, the government announced that the age at which the state pension would to be paid would rise to 66 in 2014, to 67 in 2021 and to 68 in 2028. As the announcement was made in the middle of the process of data collection, some of the participants were unaware of the policy change at the point they were interviewed while others were aware. This allowed us to assess whether people altered their expected age of retirement in response to the announced policy change. The results in Barrett and Mosca (2013) showed no reaction to the policy announcement. However, the TILDA participants did seem to react to the deteriorating economic climate in 2010. As the scale of the economic crisis became more apparent in 2010, people were more likely to respond that they did not know when they would retire. So, although expected retirement ages were not changing in response to the policy, it was not the case that expected retirement ages were completely fixed either. Another paper looking at work in later life was Hudson and Barrett (2014). The idea behind this paper is most easily motivated with reference to unemployment. It has long been understood that unemployment has negative effects on mental health. However, we also know that these negative effects are reduced if an individual’s peers are more likely to be unemployed also. By contrast, the negative effects are compounded if an individual’s peers are less likely to be unemployed. Hudson and Barrett extended this line of thinking into later life working and asked if older people who were at work were more or less happy if their peers were also at work (or out of work). They used the TILDA data and created “peer groups” by looking at employment rates in “age-gender-county” cells. The results suggested that older people at work were happier if their peers were at work also and less happy if their peers were not at work. The result suggested that a positive dynamic might be possible through which more older people at work could lead to further rises. The final paper I will consider is Mosca and Barrett (2016). Just as Heller-Sahlgren looked at the effect of retirement on mental health across European countries, Mosca and Barrett looked at this issue within Ireland. Their results showed no positive effect of retirement on mental health, which can be seen as re-enforcing Borsch-Supan’s view that retirement is not “bliss”. Instead, Mosca and Barrett found that retirement generally leads to an increase in depressive symptoms with the effect being particularly strong for people who retire as a result of poor health or redundancy. I began this short paper by noting that the sustainability of age-related social programmes is under threat in the context of population ageing. This holds internationally and in Ireland also. As a society, we need to discuss how we can ensure that our health services, long-term care and pensions can be maintained and enhanced. Extended working lives could form part of the solution so it is important that we understand whether this is feasible and/or desirable. The discussion above has shown that retirement ages are drifting upwards internationally. I have also shown that the age of retirement seems to be significantly determined by financial incentives and norms, both of which can be changed in principle. During the recession, Irish people seem to have changed their thinking regarding the age at which they expected to retire. All of these points suggest that the age of retirement can be changed. I have also presented the research from Ireland and Europe showing that retirement can be bad for mental health. Finally, I reported on the research which suggested that working later becomes a more positive experience if peers are also working later. Bringing these points together it seems reasonable to argue that we should begin to re-imagine and re-assess retirement, for reasons of social programme sustainability but also potentially with a view to enhanced well-being among the older population. Barrett A, Mosca I. Increasing the State Pension Age, the Recession and Expected Retirement Ages. Economic and Social Review 2013. Börsch-Supan A. Myths, Scientific Evidence and Economic Policy in an Aging World. Journal of the Economics of Ageing 2013. Hudson E, Barrett A. Peer Effects, Employment Status and Depressive Symptoms among Older Irish Adults. Journal of Population Ageing 2014. Mosca, I, Barrett A. The Impact of Voluntary and Involuntary Retirement on Mental Health. Journal of Mental Health Policy and Economics 2016.